Hi there, my name is Bridgy Mayfield. Along with my bestie, Sassy Cabot, I own the Read ’Em and Eat Café and Bookstore in the always sunshiny community of Fort Myers Beach, Florida. Everyone at the Read ’Em and Eat wants to say a big HAPPY FATHER’S DAY to all the fathers, grandfathers, great grandfathers, and to the uncles, aunts, brothers, sisters, moms, grandmas and friends who help take on that role is a child’s life. Great work all! Well there is a lot of excitement here in Fort Myers Beach. The grand and glorious news is that there is a brand spanking new book outlining our adventures. It is called Read to Death and I would say it is the best book about us yet, except—well, I wish our author picked someone else to be the patsy. But no, there I am a major suspect in the murder of Oscar Frieland, the funny old gentleman (well not exactly a gentleman) who drove the Cool Reads/Warm Climate Book Club to their end-of-season outing at the Edison and Ford Winter Estates. Much as I love visiting the place where Thomas Edison and Henry Ford spent their winters a century ago, boy, am I ever sorry I went along on that trip. Believe me when I say finding a dead body is a terrible experience. I wouldn’t wish it on anyone. I just want the entire episode not to have happened. Fortunately, Sassy is more strong willed than I am so she is determined to find the killer and clear my name. Does she honestly think sneaking on a fishing charter boat or hanging out in waterfront bars crawling with wharf rats will help me? Don’t get squeamish, they’re not real rats (that’s what I feared at first) but when I squealed Sassy’s new friend Bert laughed and Sassy told me that wharf rats are people who like to hang around the harbor. When she heard the possibility that I was in trouble, my mom flew down from Brooklyn and much as I love the comfort of having her around, my straight laced mom and her sister, my slightly wild Aunt Ophie do tend to get on each other’s nerves. And then, of course, the unexpected guest mom brought with her can be quite a handful. So to celebrate the July 5th release of Read to Death, I am thrilled to offer the prize of your choice. 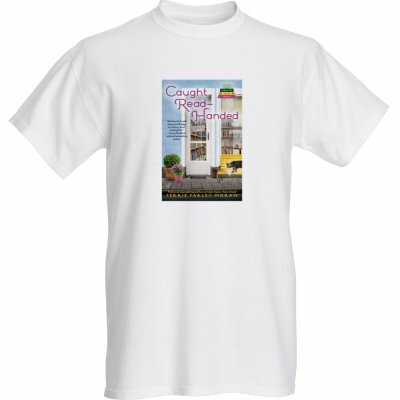 One lucky reader will get the choice of a signed copy of Caught Read-Handed or a Caught Read-Handed tee shirt. Comment below before midnight Monday June 20 for a chance to win. Don’t forget to include your email addy. 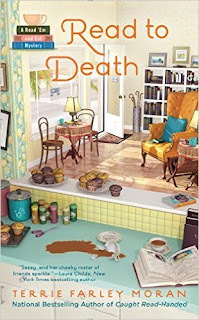 Oh and I would be thrilled if you pre-ordered a copy of Read to Death—I sort of am the star, you know. I have pre-ordered and cannot wait to read it!! Looking good. I have a gc so I think that I shall preorder. Sounds like a great place and adventure. I'll start on the first books. Love books! argolk725(at)gmail(dot)com. Can not wait for this new read :) Thank you for the opportunity.....very much appreciated. So happy to see the series continuing. Love these girls! Happy Father's Day to all the guys out there. Sounds so good, can't wait to read it! Another added to my wish list! I would love to win the book!! Loved the first two books and am looking forward to the third one! Thanks for the chance! I can't wait to read this. Great series, looking forward to reading. "Read to Death" sounds amazing. Thanks for a great giveaway. Im so excited for the release of this new book! Im in N.J. now, but used to live and work in Fort Myers! Just reading about the book, and those who hang out there, brought me back!! I think a cafe and bookstore combo is just perfect----I'd gain 10 pounds just sitting there reading. How awesome to have a cafe like this near me! What a great premise for a series! I look forward to reading it. Ohhhhh, I have to read this book! How entertaining. Great cover!!! sounds like a good read. Going to library and hoping they have them. I have also pre-ordered Read to Death but would absolutely LOVE a signed copy of Caught Read Handed since I collect cozy author's autographed books and display them on my special shelf! I enjoyed Well Read, Then Dead and wear my t-shirt around town. 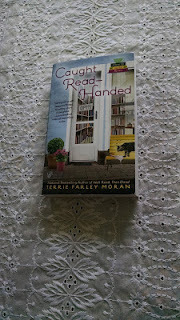 I'd love to win a print copy of the Caught Read-Handed to continue my reading journey. Thanks for hosting a great giveaway! Hi Kathleen, I found a few posts awaiting moderation. We are all fine now. Ruth, I just went into comments and found you and a few other folks hanging around. All comments are here for now. I will check again later. That is a wonderful story you wrote about your mother and your Aunt--sort of like Ophelia and Emelia! Love this series and Ft. Myers Beach! Pre-ordered.. Thanks for the chance to win.. I lioe Terrie Moran's books. I love t-shirts. Of course, I love books too. I can't wait to get my hands on READ TO DEATH. It will not be long now. Great post! Looking forward to reading more, thanks for the chance to win! I used to live in this area. Thanks for the giveaway! I look forward to reading this book! I know several people that frequent Fort Meyers to see family and friends! Contest is over. Winner has been notified. Thanks so much for participating and keep your eye here at Killer Characters because I hear that there will be a ton of giveaways coming up this summer.